Some of the most pressing questions in immigration law and policy today concern the problem of immigration controls. How are immigration laws administered, and how are they enforced against those who enter and remain in a receiving country without legal permission? 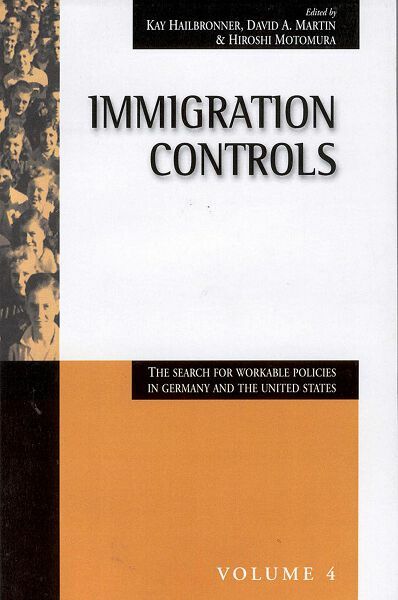 Comparing the United States and Germany, two of the four extended essays in this volume concern enforcement; the other two address techniques for managing high-volume asylum systems in both countries. Kay Hailbronner is professor of international law, European law, and constitutional law at the University of Konstanz and director of the Research Center of European and International Law of Immigration and Asylum at that institution. He is the author of numerous books and articles on immigration and asylum matters, among them Current Asylum in Germany (University of California, Berkeley, 1995). David A. Martin is Henry L. & Grace Doherty Professor of Law at the University of Virginia. From 1978 to 1980 he served in the Human Rights Bureau of the U.S. Department of State, and in August 1995 he took leave from the university to become general counsel of the Immigration and Naturalization Service (INS). Work on his chapter in this volume was virtually complete before he assumed that office, and he was not involved in the final shaping of the project’s policy recommendations or the conclusions printed in this volume. In any case, the opinions expressed therein do not necessarily represent the views of the INS, the Department of Justice, or the U.S. government. Hiroshi Motomura has been a professor of law at the University of Colorado School of Law in Boulder since 1982. Before that, he was an attorney in Washington, D.C., with a practice that included immigration law matters. He writes and lectures extensively on immigration law and policy topics, with an emphasis on constitutional issues. Publications include the law school casebook Immigration: Policy and Process (with T. Alexander Aleinikoff and David A. Martin; 3d ed. 1995) and the articles “The Curious Evolution of Immigration Law: Procedural Surrogates for Substantive Constitutional Rights” (Columbia Law Review 1992) and “Immigration Law after a Century of Plenary Power: Phantom Constitutional Norms and Statutory Interpretation” (The Yale Law Journal 1990).